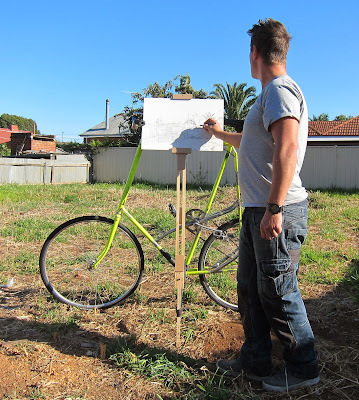 Here's version two of the Easel Rider attachment tall bike combo. Perfect for the suburban artiste with outdoor tendencies. The bike will feature in a show opening this week at Ryan Renshaw Gallery in Brisbane. It will accompany a bunch of paintings of suburban landscapes including holes in fences, dumped hydro set ups and decapitated palm trees.